It’s been a busy few weeks for me. Earlier on this month I wrote about sitting the VMware Cloud Provider Specialist Exam and continuing on from that I decided to pursue the VMware Cloud on AWS Management Exam. As I previously discussed with the Cloud Provider exam it falls into a new collections of exams from VMware that are aimed at providing skills and achievements rather than certifications. Now if you’re a little confused let me clarify it a little more. 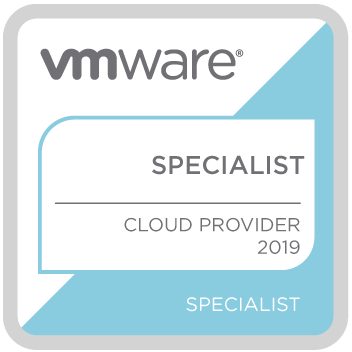 Unlike the Cloud Provider which would require you to hold a VCP and provides you a badge denoting you as a Specialist. The VMware Cloud on AWS exam has no prerequisites and gives you a Skill VMware / Acclaim badge. All straight-forward right?!?! If you’re still confused, don’t worry about it for now, many people are. Covering off some of the fundamentals of this exam. It’s a non-proctored web based exam. Meaning you can sit it whenever and where ever you like. You have 30 questions with 45 minutes which to complete it in. So while not many questions, you have only a minute and a half on average to answer each question. Being honest, it’s a fairly basic exam comparative to other VMware exams available. You’re not going to be overly challenged over the 45 minutes. We do have to put this exam into context a little here though. As I mentioned above this exam is classed as a Skill. It’s not a certification so the question count and difficulty of those questions are kind of reflected here. I would rate this Skill exam a little below the level of a Specialist exam like that of the Cloud Provider I took recently. If you look at what it’s trying to achieve as an exam it does hit the mark. Prior to studying and sitting this exam I really knew little about VMware Cloud on AWS. I had been to many sessions and presentations on VMC over the last year or so. In all the sessions I’ve seen they did a great job of explaining what it is but I still really didn’t know how to use it or all the little intricate things it was capable of. Having now studied and taken the exam, I have a much more thorough understand not just of the product but how it’s actually used and managed. The types of questions you will see in the exam can be broken up into two basic categories. Simple high level questions of what VMware Cloud on AWS can do and what those services are. Then the slight more technical, but still relatively simple, questions on how to actually perform a task. My study consisted of the VMware Cloud on AWS: Deploy and Manage three day course. It’s a paid course which you can do in the classroom or on-demand, the latter which I did. This was the bulk of my study which I crammed over three nights after work. The course covers 95% if not 100% of what is in the exam. I supplemented this with a very short demo of the VMware Cloud on AWS -- Getting Started Hands-on Lab and briefly looked at the VMware Cloud on AWS Sizer and TCO site and the VMware Cloud on AWS | FAQs. While far from being a deep technical exam. It does a decent job on testing your knowledge of the product and validating those skills. Certainly from my view point it encouraged me to actually spent some time studying VMware Cloud on AWS which I had been otherwise avoiding until now. Don’t expect to become a guru on the product afterwards but take the exam for what it is a learn something new if you haven’t delved into it until now. After many months of procrastinating I finally decided to sit the VMware Cloud Provider Specialist Exam (5V0-32.19). The exam was released at the end of August 2018, so it’s been available for quite a few months now. This comes after a long wait from the vCloud community asking for a specialist / dedicated exam around vCloud Director and its product suite. The first thing to note with this exam is that it’s not a certification but rather falls under a new collection of exams from VMware that are better represented by Skills and Achievements and are acknowledged through VMware / Acclaim Badges (as shown by the one above). It’s a relativity solid exam, I feel sitting in between an Associate and Professional certification in terms of difficulty. Having used vCloud Director and its various suite of tools for quite a few years now. I took this exam cold with no additional study. I managed to answer the 40 questions in a little over 30 minutes and then spent 10 minutes reviewing about a dozen questions I was a little uncertain on. Generally speaking, with these kind of exams, you either know or don’t know the answer. So trust you gut instinct and put your answer as the first thing that comes to your mind. Then flag it for review if you are truly uncertain. So what should you do if you want to take and pass this exam? It’s a little tricky for me to definitively recommend study material as I relied on my previously gained knowledge of the vCloud Director and it’s various product line. I would certainly say this is an exam for someone that administers and engineers vCloud Director solutions. That’s generally going to be someone in the Service Provider space. If you don’t use vCloud Director I would question the real benefit you would gain from this exam, with the exception of forcing you to study up on the various products that go into this exam. If you’re still set on this exam and don’t have access to vCD you’re best bet would be Hands on Labs HOL-1983-01-HBD -- VMware Cloud Provider Program -- vCloud Director for Service Providers. 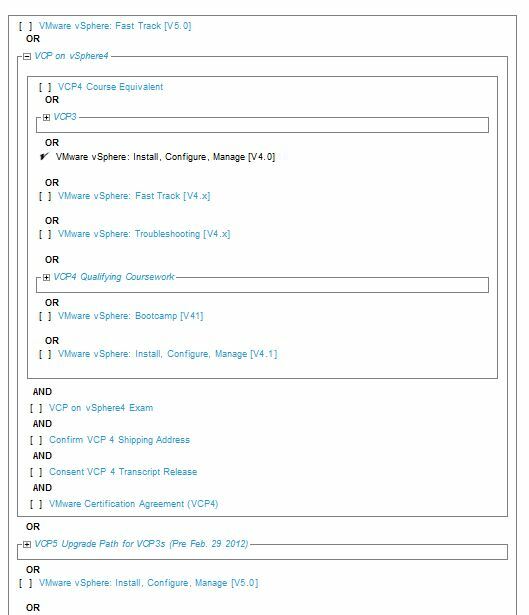 There is no formal Blueprint that I’m aware of but there is an Exam Preparation Guide PDF for the exam on the VMware Certification site. It has quite a lot of Sections and Objectives to work through and a huge amount of reference material. This could be quite a challenge for someone new to vCloud Director to work through. Generally speaking though you will need to know vCloud Director. It’s the core focus of this exam. The exam is also based on vCD 9.1. This is extremely important to know. For example things like supported databases have changed in recently releases of vCD leading you to in incorrect assumption for the answer. While it’s unlikely you’ll be asked to specifically do something around point and clicks. You will more likely need to understand all the different terminologies and constructs used in vCD and how they relate back into vSphere. You should understand the concepts and components behind vCloud Extender. What it is, what it does, and how you might use it. The same goes for vCloud Usage Meter and it’s newer SaaS offering Usage Insight. While I don’t recall but you may see some questions around vCloud Availability too. You’ll also probably see a few questions around a new product, Cloud Provider Pod and Cloud Provider Hub. Very few people would have hands on experience with this new product. It’s basically an Orchestration platform to stand up an entire vCloud Director stack from bare metal. I’d recommend watching the VMworld presentation Introducing VMware Cloud Provider Pod presented by Wade Holmes which should give you all the high level information you need on it. As mentioned above, this is a solid exam. It covers quite a lot of different products in VMware’s Cloud Program Program / vCloud suite. It’s ideally suited to Service Providers using vCD. vCloud Director is a very intricate product with many external dependencies. The exam is a great way to validate and acknowledge those skills you have acquired with vCD and associated products. Earlier this week I took and passed the VCP-NV (2V0-642) exam. I do have to say it was a really good experience. It’s one of the few exams I really did enjoy studying for and sitting. So I thought I might use this as an opportunity to post a short recap of my experience and what I used to study and pass the exam. Getting some of the technicalities out the way all of which can be found at VMware’s VCP-NV landing page. The 2V0-642 exam is VMware’s updated version 2 of the original VCP-NV exam which officially came out back in 2015. Back then it was a 120 questions and by all accounts much harder than this new revised version. This revised exam, based on NSX 6.2, is 2 hours long and 77 questions with a standard 300 passing score out of 500. If you currently hold a VCP the process to certification is fairly straight forward. Take and pass the 2V0-642 exam and earn certification. If you don’t hold a VCP you have a number of pre-requisites to meet. Again, all of which can be found at the VCP-NV landing page. So first how was the exam? As I mentioned above, a really good experience. Gone are the days of having to take a pre-exam survey. Just acknowledge the Terms and Conditions and the exam begins immediately -Awesome. The questions were well laid out, clear, and descriptive enough to understand. Of course it wouldn’t be a real exam without one or two confusing questions and there were a few of them, but only a few. The exam questions are all weighted so at the end of the day it is a level playing field for everyone. So what was my process for studying for this exam? I guess firstly I’ve attended many presentations and watched a number of high level videos on NSX but nothing really deep on the product, nothing really exam helpful. A few months back (the week before VMWorld) I attended the 5-day Install, Configure, Manage course on NSX 6.2. This was a great course and a good primer into learning to use NSX. Very helpful grasping the fundamentals in being able to get started. Well recommended for everyone getting started. Next came actually using the product in a real lab environment. I think this is a requirement! Bare minimum you should be using VMware’s Hands on Labs but even better is to have your own environment. I’m lucky enough to be preparing for a production deployment and had a test lab to deploy and play with. Having your own environment constantly available is hard to beat. vBrownBag YouTube videos! There is a VCP-NV series available on YouTube. The videos are based on the original VCP-NV exam and are a few years old but still very relevant. Actually still extremely relevant. There’s eight videos to hunt around for which cover the original objectives with the exception of Troubleshooting. The Objectives match up very closely. The 2V0-642 exam has one main new Objective which covers Cross-vCenter. In terms of reading material i would highly recommend going through the official NSX online docs pages. Lots of mindless reading but you will find that exam questions come straight out of that. And truthfully you will learn a huge amount doing that. Just remember to focus on version 6.2. I’d also recommend the Cross-vCenter NSX Installation Guide PDF from VMware. This is also in the online docs but I found the PDF easier to consume which I found to be hugely informative and the exam did test heavily on this for me. So I was very thankful to have focused on this reading. And that was basically it. Practice hands on what you have learnt and read. Troubleshoot in your lab as you are building it out. A few solid study days on the weekend and you should be in a really good position to take and pass the exam. A few months back I took VCE™’s (or as I like to think of them, VMware + Cisco + EMC) 5 day Administration and Management training course. It was held in EMC’s Melbourne office. It was a really well run course taught by an instructor from Malaysia. After the course I was keen to pursue VCE™ certification. There are currently two Tracks available, Manage and Deploy, with a soon to be released Design Track, all of which contain three levels of certification. I found the most relevant to me was the Mange Track. Step 1 in my study was obtaining the prerequisite Associate status, VCE-CIA. Very similar in concept to VMware’s associate program. It’s an online exam which can be taken any time at home. Best of all, unlike VMware’s VCA, it’s free. Registering and taking the exam links you over to EMC’s education portal. The exam is presented after a free 4 hour foundation course (which can be skipped at any time). There is no time limit with a passing score of 80%, though, I don’t recall how many questions. I did find it interesting that you get a second attempt at a question if you failed to answer correctly. I ended up passing with 96% which I think equated one question wrong. With the Prerequisite out the way I could now study and take the second level Administration Engineer exam. The study material PDF from VCE™ was pretty vague. A few links to company websites, an EMC VNX PDF, a VMware vSphere PDF, and a Cisco UCS Manager Configuration Guide. I used the practice exams from VCE™ to gauge my rough level of knowledge. As expected I found my weak area was Cisco UCS. While I have hands on knowledge with all three vendors in my day to day role most Cisco UCS work is done by a different team. So I choose to use Pluralsight’s Implementing Cisco UCS Training to fill in the missing knowledge. It was an excellent course presented and run by Jason Nash. This course ended up providing 98% of the Cisco material I required to pass the exam. The exam is booked through Pearsons and currently costs $200 USD. I found the exam itself fairly true to the practice questions provided by VCE™. The VCE™ exam guide stated 60 questions over 90 minutes. I ended up getting 65 questions. I can only assume five of those questions were evaluation questions for future inclusion into the exam. Time was not an issue at all. As I expect I felt the exam tested on knowledge a mile wide but only an inch deep. Unless you ask 200+ questions it’s near impossible not to do so, especially when you have three products that have individual certs in their own right. As with the rest of the industry, VCE™ certifications expire after two years and need to be renewed. All this does is make it ever so harder to hold onto certs in multiple disciplines nowadays with something always expiring. Rather than immediately looking to take the third and final Master Engineer cert in the Manage Track I’ll be holding off. The intention being to renew and upgrade my certification status at the same time in the future. Well, exactly two weeks after taking my VCP510 exam I received a confirmation email from VMware on the status of my VCP5 certification. I say status, and not approval, because there are still steps that need to be taken in the myEducation portal. During the research in taking my VCP and the process of what happens after you take an exam I found a lot of people in a similar boat to me, confused about what to do next. I touched on some of this stuff in my previous post “VCP today, I think?!?!“. So for this post I thought I might exam what happens after you take the VCP exam. So after you take you exam –and I’ll assume you pass. If you’re like me you’ll face a nervous wait to receive an email from VMware confirming whether you have met all the prerequisites. For people who had taken the exam around February 2012 the wait was as long as 4-6 weeks. At this time of year the wait is much less. The email states there are three things I need to do before my transcript will reflect my certification status. After logging into myEducation Portal and selecting myTasks. I could now see a new Plan with an option to Manage. Selecting this brings up very detailed track list of prerequisite courses and exams. VMware should make this list accessible as it would make understanding the certification process much easier. It would appear that the VMware email is a little out of date as there is now a fourth item that needs to be completed in addition to the above three. You now also need to select the link to request a VMware Workstation 8 license. Kind of a strange step, but a free license, I’m more than happy to go along with it. Once all completed, the progress should now state Completed at the top right of the Plan. VMware say to wait 24 hours for the certification to appear on your transcript. I received an email a couple hours later. Unfortunately the process continues. The mailed out certificate takes 4-6 weeks to arrive and access to the VCP Portal takes up to 2 weeks. But hey, at least I’m finally recognised as VMware certified. Part 1 -- VCP Today, I think?!?! 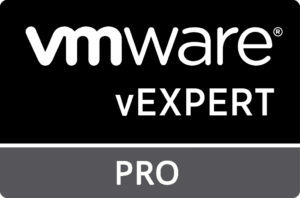 Finally after two years I’ve managed to make the effort to sit my VMware Certified Professional exam. In itself, not really news worthy. So why is it up on failsys? Well… because of the process I went through. Anyone can sit a VCP exam, but pass or fail, to become certified by VMware you need to attend certain authorised training courses first and meet VMware’s prerequisites. 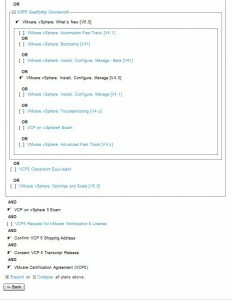 Two years back I attended the vSphere: Configure, Install, Manage [V4] course. Now don’t get me wrong, it was a great course. The instructor was knowledgeable and knew how to sell, present, and generally get the most out of the course material. After this four day course I expect to be able to sit the exam. At the conclusion of the course speaking to the instructor, someone who had sat the exam and going through practice tests, I realise that I was nowhere near ready. The exam went well beyond the high level overview of course material on how HA worked. You needed to know more than just the concepts about SANs, iSCSI, FC. Stuff that I thought I had but realised might not be good enough. VMware provide a thorough Exam Blueprint document that is intended to provide all the objectives of the exam and links to VMware documentation that cover those areas. The amount of documents and pages to read is quite disheartening. Fortunately work paid for the course but I still felt a little cheated afterwards. Fast forward 18 months later, vSphere 5 had just been released, and I had still not sat the VCP exam. In between that time I had happily studied and passed other non VMware exams. 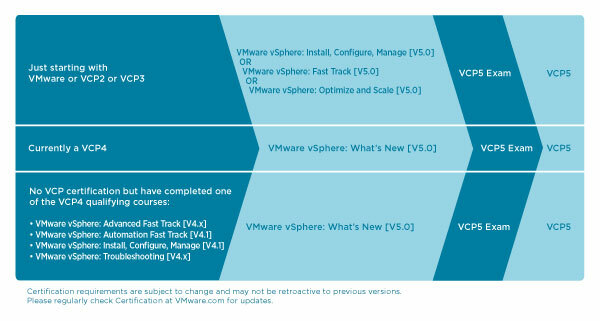 So when a new job asked what training I would like to do chose vSphere: What’s New [V5]. What’s New [V5], at the time and still is, solely not good enough to become certified. In late 2011 you still needed to have sat the vSphere ICM [V5] course or during the certification grace period currently be a VCP4. I would either have to sit the VCP4 exam or talk work into also sending me on the full vSphere ICM [V5] course. Fast forward another 6 months. The prerequisites have changed a few times and now allows a non VCP4 holder with the right qualifying course to take the VCP5 exam. When I was offered an exam voucher at the end of last month I decided to cram and finally take this exam. So after two years I’ve finally sat the exam and believe I finally met the complex and ever changing VCP requirements. From what I gather the VMware certification process after passing the exam can take as long as 6 weeks. Seems like VMware lack Microsoft’s automation in this process. I have mix opinions on this whole process. I’m one of those people that like certifications. They’re certainly not, ‘the be all to end all’, but they are a nice to have. They show that you’ve gone that extra mile when you didn’t have to. I’ve seen many resumes over the years pass my desk. Many students, fresh from Indian University, and more certifications on their CV than I can count on my fingers. Too many certifications can obviously be a bad thing when not put in context. VMware’s approach of having to meet course requirements is a good start. It is frustrating though when those courses have little relevance to the exams. It feels like a token donation (a large donation at that) to the training provider to achieve certification. When you have Indian training institutes selling budget courses due to the high turnover of students and other regions around the world paying high premiums it does seem unfair. In all honestly I’d like the see the prices of courses come down, maybe 5 day courses shorten to balance the price reduction. To counter this, courses and / or certifications could only be obtained with a corporate sponsor. Now lets be completely honest here. VMware courses are very specifically directed at the experience IT worker who has been in the industry at least 24 months. Having a corporate sponsor (not a training institute) would dramatically cut down on paper certification university students fresh out of school.